Spring House Press, 9781940611716, 200pp. Many of the everyday products we rely on through pregnancy and baby's first year are actually quite simple to make at home with safe and natural ingredients. Making your own food, homemade skin care products, and everyday objects allows you to choose exactly what you put on and into your body. 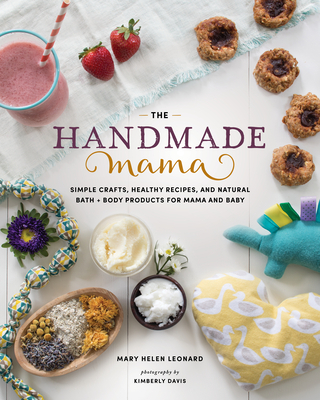 With help from Mary Helen Leonard, natural lifestyle writer of the blog Mary Makes Good, you'll create handmade items for mama and baby using sustainable materials. You pick the color. You choose the ingredients. You make adjustments to suit your own tastes and needs. There's nothing better than custom-made, and when you do it yourself it can actually be affordable The techniques you'll discover in The Handmade Mama will make cooking, sewing, and planning your own healthy baby projects a breeze. From ginger syrup for upset stomachs to baby powder, changing mats, food purees, teethers, and simple toys, this book is stuffed with useful projects, tips, and sidebars for a natural pregnancy and baby's first year that you'll cherish.